Skinodor - the Plymeric Matrix in the skinodor yarn contains an active bacteriostatic substance wich will not transfer to the skin. This significantly reduces bacterial growth, assuring long term protection against common complaints such as foot odor. Robur - is a multifunctional hollow core fibre. It is breathable, elastic and offers excellent cushioning from pressure and shock thanks to the air contained in the fibre core. The superior three-thread finish is extremely durable and abrasion resistant. Mythlan - is an extremely lightweight, innovative high tech yarn made of many ultra light, self contained micro fibres that prevents the growth of odour and bacteria. Mythlan is non allergen breathable and easy to care for. Is an air channeling system made of a finely woven knit-mesh that continually circulates air and regulates the temperature around the foot. Located along the inside of the foot and extending up from the anatomically shaped foot-bed, it ensures that every movement of the foot pumps the moist, warm air out of even tight fitting shoes. This cuff adapts flexibility to every leg girth without slipping or constricting. Duckbill shaped Footguard this pad protects the upper part of the foot, evenly distributes pressure, and significantly reduces the chances of skin abrasions and chafing. The width of the stretch ribs is dinamically regulated to ensure that the foot is never constricted - always a perfect fit. Flap prevents the sock from slipping into the shoe. Absorbs pressure and perfectly hugs the contour of the asymmetric toe area. Reduces the incidence of pressure points and the risk of scraping and bruising. Reduces friction and the risk of blistering. Cushions and stabilises the sensitive ankle area without restricting freedom of movement. Regulates the temperature of the sole of the foot and conducts moist and overheated air into the AirConditioning Channel®. Cushion and secure the ankle, maintain a protective distance from the shoe, and ensure continuous air circulation. 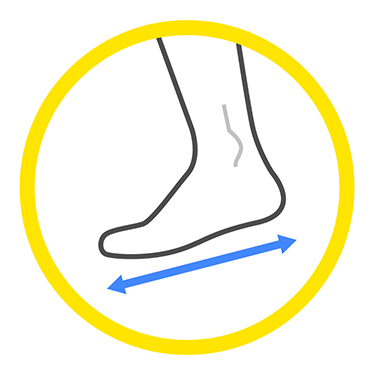 Anatomically shaped footbed for the "R" and "L"
Foot with the integrated AirConditioning Channel: conforms to the anatomy of the feet and supports and cushions them where they need it most. Your feet gain support and stability - without losing contact with the boot due to unnecessary, confining padding. The real silver in the terry loops of SilverNodor effectively diminishes foot odour and significantly lessens the risk of contracting athlete's foot.